At Gen Con this year, Deep Water Games held an open session of the game Welcome to… in a large room at the Indianapolis Convention Center and announced that they were looking for two hundred people to play it. It was a hell of a marketing gimmick, both because the number was such an attention grabber and because it demonstrates so well the way Welcome to… scales to any number of players. With simultaneous turns and plenty of decisions for players to make, it’s quick to play but has the depth of a much longer game, and it plays as well with two as it would with two hundred. 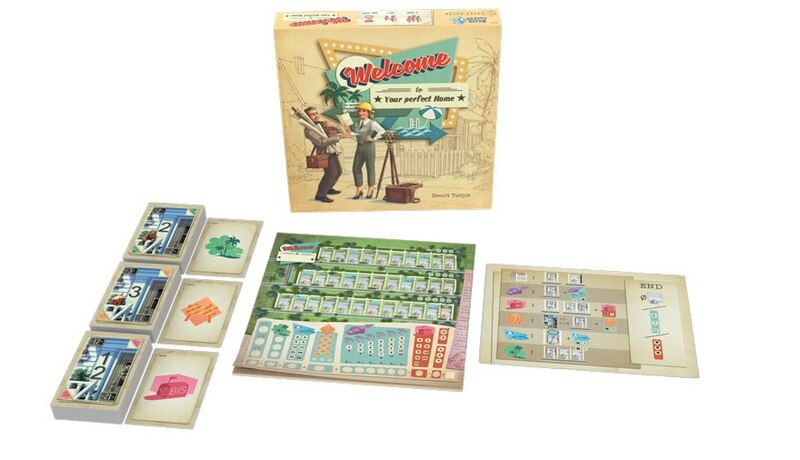 In Welcome to… each player gets a paper map of their new town, with three streets of 10, 11 and 12 houses. All players work from three decks of house cards to fill out their towns to maximize their point totals while obeying numbering rules—your houses must go in ascending order from left to right on each street, lest you confuse the mail carrier. On each turn, the top card of each deck is flipped to create a new pair of cards: a house number from one to 15, and one of six possible actions for the player to take. Each player chooses one number-action pair, writes the house number somewhere on their map, and takes the (optional) action. Two players can choose the same pair, of course, and everyone takes their turns at the same time. The numbering is important, but the actions are the heart of the game. There are dashed lines between all the houses, and you can take a fence action to make one solid, creating “estates” between the fences or between a fence and the end of a street; estates can comprise one to six houses, and you earn points for each completed estate (fenced in, all houses assigned numbers) at game-end. The real estate agent action lets you increase the points you earn for a specific size of estate—for example, you can increase the point value of a one-house estate from one point to three. The temporary worker action gives you flexibility on the house number you use in that turn, allowing you to increase or decrease it by one or two (so, yes, you could number a house zero, or go up to 17). Some houses have pools drawn above them on your map, and if you take a pool action, you can write that associated number on one of those houses and score the pool, with the value of pools increasing the more you build. The park action lets you increase your points for parks on the street where you’re writing the house number; if you max out your parks on any street, the point value jumps to 10/14/18 depending on which street. The last action allows you to duplicate a house number you’ve already placed, which can be critical in filling in an estate or any other gap you’ve created on a street. It’s the only action with a penalty associated with it; the first time you use it, you lose one point, and the penalty increases the more you use it. But filling in all your house numbers without ever needing this action is difficult, and you may decide to plan for this action to score more points elsewhere—for example, you might want to put number 11 on a house with a pool to score that feature, but by doing so, you’ve left a blank house between that and house number 10, which you could only fill with a duplication card that lets you number another house as 10 (you would write “10 bis” for the mail carrier). Each game starts with three city plan cards showing combinations of estates that you can score if you build them—fence them off, with all houses numbered—such as one estate of three houses and one of six houses, or four estates of two houses, or the combination of one-house, four-house, and five-house estates. The first person to achieve a city plan card gets the top bonus, after which the card is flipped and any other players who meet it get a smaller bonus. The game ends when any player fulfills all three city plan cards, or when a player places numbers on all 33 houses, or if any player fails three times to use any of the three options on turns (because their map precludes it). Players then score for city plan cards, parks, pools, temp workers used (if you use the most, you get seven points; second-most four; third-most one), and estates sized one to six, and then deduct points for using the duplication action and if you failed to take any actions at least twice. Winning scores run around 100 points for us; my daughter currently holds the house record at 118. Games can take 20-30 minutes, depending on whether you have any indecisive players in your group. We’ve played this game repeatedly since we first opened it, because it’s sort of a puzzle within a board game, and every game ends with us wondering what we could have done differently. Each turn brings a set of decisions, from where the optimal house is for a certain number (the card frequency varies, so card eight is the most common, and cards one and 15 the least) to which action to take and when. Setup is simple enough that you can start a new game two minutes after you finish one. We’ve had just two quibbles with Welcome to…, and neither is related to the rules. One is that marking fences is better if you use a colored pencil or marker, because you need to be able to see those at a glance to score at the end of the game, and once you score an estate for a city plan you can’t further subdivide it. The other is that several of the cards in the game have a stamp saying Department of Housing and Urban Development that’s dated 1953 … twelve years before HUD was founded as part of Lyndon Johnson’s Great Society. We still love the game, though, between the puzzle aspect and the replay value provided by the 216 possible city planning card combinations, with more city planning cards an obvious spot for an expansion, too. It’s been a huge hit, with Deep Water running a successful Kickstarter to fund a large second printing, and it’s completely justified, as Welcome to… is the best new light game I’ve played in 2018.